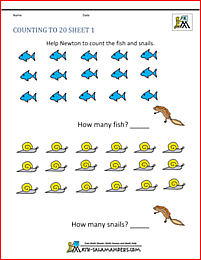 Welcome to Math Salamanders Kindergarten Counting Sheets. Here you will find a wide range of free printable Kindergarten Math Worksheets, which will help your child learn to count up to 25 objects. Here you will find our range of Free Kindergarten Numbers Sheets. The sheets cover the following areas: counting up to 5, counting to 10, counting to 15, counting to 20 and counting to 25.
count different sets of objects up to 25. Your child needs to be able to count objects to 10 before they can count up to 25. These counting to 25 sheets involve coloring the correct number of object to make the required amount. The sheets below are similar to those on this page, but at an easier level. There are counting and matching to 10 and 20 activities. 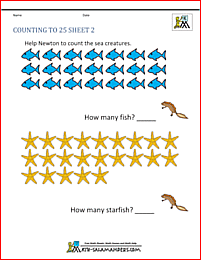 We also have some more challenging comparing numbers worksheets for kindergarten. These sheets involve comparing numbers and amounts up to 10. 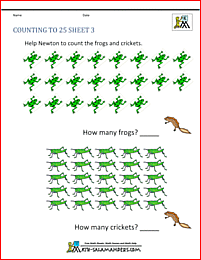 They will also help children decide whether one amount is greater than, less than or equal to another amount.